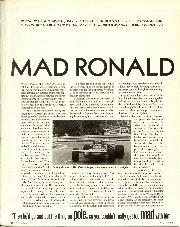 "Mad Ronald," Mike Hailwood used to call him. Twenty and 30 years ago, Grand Prix racing may have been infinitely more perilous than now, but it lacked the hard edge of today, and friendships between the drivers were the norm. In Hailwood's humour there was affection for Ronnie Peterson, a gentle fellow adored by the paddock, a charger worshipped by the fans. Ronnie was never a textbook racing driver, in the Stewart sense of the word, but rather one who could make a car dance to his tune, a man of consummate reflex and instinct. Rene Dreyfus once said of Tazio Nuvolari that understeer and oversteer were an irrelevance in his case; whatever the car's inclinations, it would do what its driver required. 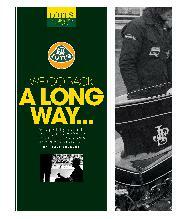 The same could be said of Ronnie Peterson. In all truth, it was just as well, for Ronnie was a lamentable test driver. "He was amazing in that respect," Colin Chapman said. "You could change a car quite fundamentally — and he'd still turn in the same sort of times! So you'd ask him how it felt different from before, and he'd say, `Ummmm, slides a bit more...' Where? At the front, the back, both ends? And he'd say he wasn't really sure. Made me tear my hair out. 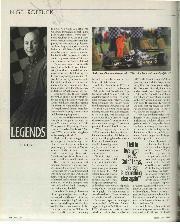 Then, of course, he'd go and put the thing on pole position, so you couldn't really get too mad with him..."
Peterson was at his best, Chapman maintained, when partnered with a supreme test driver, and it was fortunate that, in two spells with Lotus, his team mates were Emerson Fittipaldi and Mario Andretti. "He'd mess around in practice, while Emerson worked on his set-up, then copy his settings and nick pole position from him! Used to madden Emerson, that, and you couldn't blame him." So abundant was Peterson's talent that he could drive around any problem his car might have, and had the confidence to commit to a flat-out comer in the certainty that he could sort it all out. "I don't think Ronnie ever had the mental application that a complete racing driver needs," said Jackie Stewart, "but I admired his ability tremendously. Any number of times, particularly in 1973, I'd follow him into a corner and think, 'Oh-oh, Ronnie, this time you've overdone it, you're gone!' But he always seemed to get it back somehow. It never surprised me that the spectators loved him — he was exciting to watch from where I was, too!" The spectators indeed loved him. Like Jochen Rindt, he was a driver who made you seek out a particular corner for the privilege of watching him through it. In all these years of watching Grand Prix drivers at their work, I have never seen anything better than Peterson's Lotus 72 through Silverstone's original Woodcote Comer. Ronnie would have been wasted in the high downforce era, because delicacy, while still required to some extent, is largely hidden by the sheer ability of the cars. That black Lotus through Woodcote was all catch-lose-catch, the tail always trying to come around, the driver always ready for it. Balance, that was the thing. Peterson always reckoned that he was not a natural sportsman, but when he holidayed at Andretti's Pennsylvania estate, Mario saw another side of him. "We had all kinds of toys there, and I really put it him through it. He was on the bikes and the buggies, and he was so competitive in everything he did. He'd never been on slalom skis before, for example. It takes time to get used to those things, but Ronnie made it first time he tried it. That impressed me." Statistically, Peterson's career is not especially impressive, with 10 victories from his 123 Grands Prix. But statistics alone cannot tell of a man's significance in his sport. In only four of his nine years in Formula One did he win races, and the truth is that much of his career was squandered on poor cars. For example, he raced 47 times for March in two spells — from 1970-72 and then again in 1976 — and those races yielded but a single victory. On the other hand, it's worth pointing out that his victory at Monza in 1976 in the March 761 was the works team's only 'full' Grand Prix victory, Vittorio Brambilla only being granted half points after his rain-shortened win in Austria in 1975. By the end of 1977, there were many who believed Ronnie's great days done. With Lotus he had excelled in 1973 and '74, leaving few in any doubt of his status as the fastest there was, but new cars from Chapman failed to deliver, and early in 1976 Peterson returned to March, then spent a lacklustre season in Ken Tyrrell's six-wheelers. He just didn't have it any more, people said; he was pudgy and unfit, not the charger of old. Ronnie admitted that the spark was temporarily gone. "I got very depressed, and it affected me. It was another season wasted, and one I'd expected to be good." Thus, he began talking to Chapman once more. 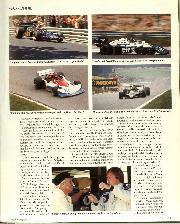 "I looked at what Mario had achieved with the Lotus 77. That car was dreadful when I left, but he and Colin made a winner of it. Then I saw the 78 usually lapping me! and knew I had to get back there somehow. It was no time to be proud." So, cap in hand, he went back to his old boss, and in the cap were sizeable cheques from a couple of sponsors. It may seem an absurdity today that a great driver should need to buy a ride, but Peterson knew how Chapman's mind worked; knew, too, that his own stock was low. Andretti did not initially welcome the idea, reasoning that he had dragged Lotus back from the mire, and was now being asked to share the harvest of his work. "Tell me where it's written we need two stars in this team," Mario growled. 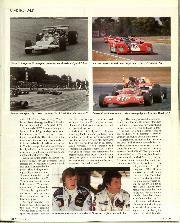 "When Peterson and Fittipaldi ran at Lotus together in '73, they won a bunch of races and neither won the championship. I don't want that to happen again. I've signed as number one, but I feel bad that Ronnie has to accept number two, because that's not what he is." By and by, though, it ceased to be a problem. In their few months working together, their friendship became as firm as any I have known between drivers, and Mario admitted he had reckoned without Ronnie's absolute honesty: "Something, let's face it, you don't encounter often in this business..."
What the pair of them had in 1978 was the Lotus 79, the first true 'ground effect' car, and one consummately superior to its opposition. 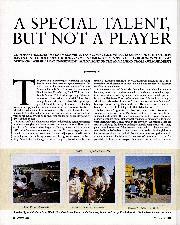 From early in the season, it became apparent that the World Champion would be either Andretti or Peterson, but the odds were squarely in Mario's favour, because Ronnie's contract required him not to beat his team mate. "A lot of people were very sniffy about that," recalled Chapman. "But Ronnie wasn't one of them. He knew damn well that Mario had earned the championship. Ronnie was a very great driver, but he owed a lot to Mario, and he knew it. 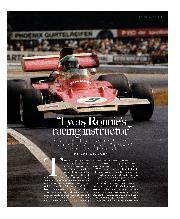 It was Mario who made the Lotus 79 the car it was, and Ronnie benefited from that. He was a very honourable man." So he was. In the first half of the season Andretti, more at one with the new car, usually won on merit, but by the time of the British Grand Prix Peterson's freakish speed was asserting itself. There he took pole position, on race tyres, while Andretti worked through nine sets of qualifiers in his attempts to match him. Mario made no bones about it at all: "He was quicker than me that day. I think Ronnie's style was better suited to race tyres, because he liked to manhandle a car, and he destroyed qualifiers very quickly. On race tyres, he could just stay out there, wait for a clear lap, and then he would feel free. He'd just flat boot the damn thing, and really get it on. That was Ronnie." By now Peterson's rehabilitation was complete. At Zandvoort, in late August, his plans for the following year were settled. "I'm going to McLaren," he told me. "It's not announced yet, but Mario knows. Now people are saying I should forget our agreement, and just go for it, but I had open eyes when I signed the contract. And I also gave my word." 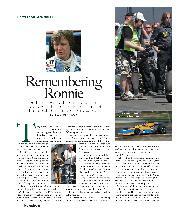 "I had no worries about Ronnie, even when I knew he would be leaving the team," Andretti said "Even after all those years of racing, he still had this sort of innocence about him. His word meant something." That afternoon they registered their fourth one-two of the season, and now Monza, where Peterson had won three times, awaited. Seconds after the start of the Italian Grand Prix Peterson was involved in a multiple accident, and suffered dreadful leg injuries, but there was no suggestion that his life was in danger. The man at risk seemed to be Vittorio Brambilla, another involved in the carnage. In the Lotus motorhome that evening, Andretti, still in his overalls, slumped in a corner, weary and hollow-eyed. He had clinched the title, yet hardly felt inclined to celebrate. Everyone was half-heartedly drinking champagne, but the conversation, sober and intermittent, was all about Ronnie. Mario lit one of his rare cigarettes, and peered around the curtains at the paddock, now inky black. "Professor Watkins says his vital signs are good, and that's what matters. It's going to take time for his legs to mend, but the Professor sees no reason he shouldn't drive again. Let's raise a glass to him..."
Conscious and rational after the accident, Peterson had been taken to the Niguardia Hospital, in Milan. During the night, following an operation to reset his legs, blood clots developed in his lungs, and in the early morning he died. Andretti arrived shortly afterwards, and was given the news. "Unhappily, motor racing is also this," Mario muttered, and then he left. No one ever more simply, more movingly, summed up the checks and balances of our sport.